Baha'i author Brad Miller, who published on the "Seneca Falls First Woman's Rights Convention of 1848" in Journal of Baha'i Studies (1998), has a new book for sale on Amazon, The Soul of the Maine House: For Those Seeking a Spiritual Home in America: A Radical Religious Reflection . 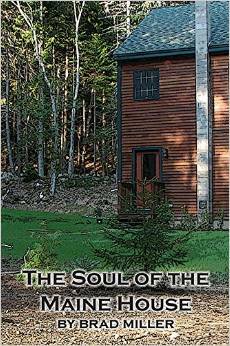 Soul of the Maine House is a narrative non-fiction account of building a small house on the coast of Maine. Miller’s son designed it, a remarkable Maine crew built it, while the author and his wife camped out, cut firewood, stained 600 cedar clapboards, painted the interior, and recorded the process. Miller places the building process in the sweep of Maine history, from the time it was called Mawooshen by the Eastern Abenaki, through the political turbulence of the 16th and 17th centuries when the French and English vied for control of this land and its fur trade, until today. The book is fearless in its ethical and moral inquiry of America’s beginnings, but it is also personally revealing and even self-incriminating in its search for a pristine spot on which to re-imagine American spirituality in the woods of Maine and in the woods of the world, a new house indeed. The book should interest those who search for deep historical and ecological understanding, but it will awaken spiritually those who wish to heal the historical hurt of the American soul, and to change their lives. The Soul of a Maine House. is not about a haunted house, but about a house haunted by the American experience on the very land on which the Maine House is built. The subtitle, For Those Seeking a Spiritual Home in America: A Radical Religious Reflection., suggests that this quintessentially American homestead, built from scratch in close interaction with the land, is a sweeping meditation on the American environment, both physical and spiritual. The Soul of a Maine House. explores American colonial history, which necessarily includes the history of Native Americans in that region, through a narrative, yet factual approach to the American experience. The Soul of a Maine House. would make an attractive text for adoption in American studies courses as well. Much in the style of books such as Letters from an American Farmer (1782), The Soul of a Maine House may be compared to a more recent title in this genre, Island Farm. by Arthur Versluis (2000). Articulate, engaging and thought-provoking, The Soul of a Maine House. opens a window into the very soul and heart of America. Of interest to all thoughtful Americans interested in a deep understanding of the American experience. As an American Indian I want to thank you for letting us know about this book! It is very important to the Many Hoops Around Thanksgiving project which I am working on with another Baha'i who is a direct descendent of a pilgrim family. We are working through our personal relationship as Indian and Pilgrim to explore ways to more effectively start the healing of two races living on a mutual land base. In this manner, history becomes the present and the future. This book will assist us in more fully understanding our mutual history.